Mumbai, the commercial and entertainment capital of India. Distance between Mumbai to Nashik is just 165 Kms. Nashik is a well known and ancient city in Maharashtra. Considered to be one of the most sacred place for Hindu, this city is situated on the bank of river Godavari. Nashik city also known for the marvellous temples and beautiful getaways in and around it. This ancient has a number of Hindu, Jain and Buddhist temples. Nashik city is referred to as Ram bhumi as this city is associated with a number of stories from the epic Ramayana. 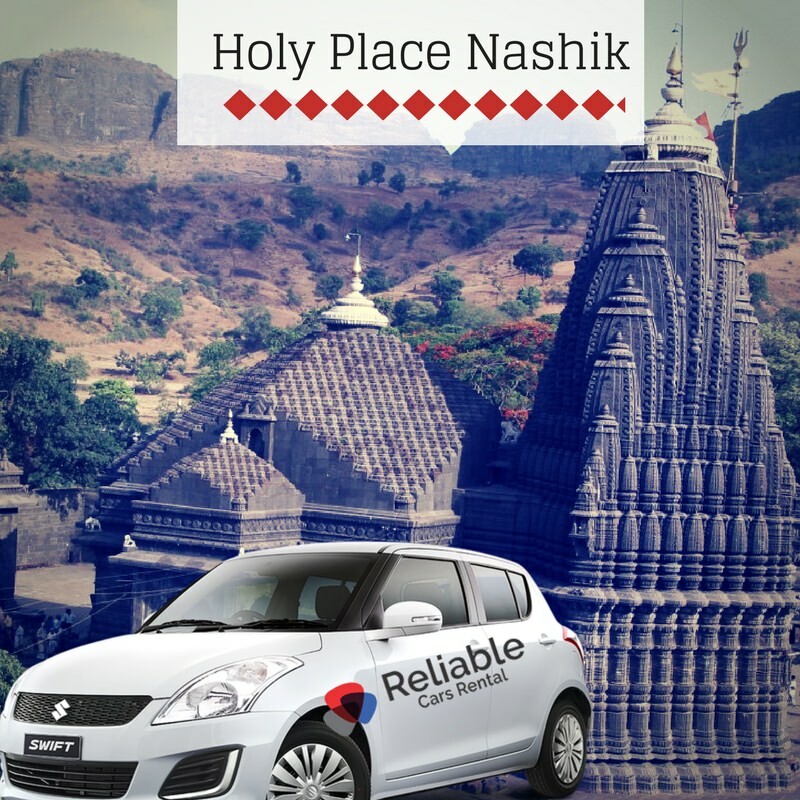 If you are planning the trip from Pune to Nashik, Reliable Car Services is the best option for your to hire a car on rent. With Reliable booking a car is more easier for you, as we are just few clicks away. You will get a various cars option to choose for your comfortable journey. Nashik city has various places that one can explore. It is a beautiful city which offer peace with spirituality and refreshing sightseeing. Here are some famous place of Nashik that one cannot miss. 1.Ramkund: The famous belief about Ramkund is that Lord Rama had taken a bath there. Also it is said that Lord Rama had performed the spiritual rituals of his father ‘Dashrath’ in this pond. Because of this reasons many devotees frequents here to have a holy dip. 2.Saptashrungi: Goddess Saptashrungi Temple situated 60 kms from Nashik, this temple is a holy place for Hindus. Located on range, consisting of seven hills. Beautiful scenic view from the temple, especially during monsoon. 3. Trambakeshwar: One among the 12 Jyotirlingas, Trambakeshwar is sacred place for Hindus. Situated about 38 Kms away from Nashik. Devotees from all over the India came to Nashik to seek blessings of Lord Shiva. The temple is perched on the Bhramhagiri Mountain. It is said that River Godavari originates from here. 4. Muktidham Temple: Muktidham is famous temple devoted to Lord Krishna and it made up of Marble. With unusual architecture, this temple has 18 chapters carved on the walls. 5.Coin Museum: Coin Museum is located near the Anjaneri Hills, it is constructed in the year 1980 under Indian Institute of Research in Numismatic Studies. The museum has an excellent collection of research and well-documented history of Indian currencies. This museum is the only museum of its kind in Asia. 6.Anjaneri Hills: This place is said to be the birthplace of Lord Hanuman. The name Ananeri is derived from Hanumans mother name Anjani. Lord Hanuman had spent his childhood and grew up on the same hill. Situated 20 Kms from nashik, Anjaneri is one of the tourist attraction of Nashik city. 7.Sita Gumpha: Among all the tourist attraction of Nashik city, Sita Gumpha is one of the most attractive places. As per Hindu Mythology, it is believed that from this gumpha Ravana kidnapped Sita Mata. Lord Rama, Sita and Lakshmana is being worshipped by the devotees inside the cave. 8. Pandavleni Caves: Buit by Jain Kings, Pandavleni Caves are 2000 year old. Pandavleni Caves are situated on Trivashmi Hill’s, located at a height of approximately 300 ft. Around 24 caves were built by Jain kings and these caves housed Jain saints like Veer Manibhadraji, Tirthankara Vrishabdeo and Ambikadevi. 9. Vihigaon Waterfall: The Vihigaon Waterfall is one of the most attractive places to visit in Nashik. Located 51 kms from Nashik city, it takes approx 1 hour 30 mins to reach. One can explore the varied flora and fauna around the waterfall with lush greenery. Also an ideal place for mountaineering. Kumbh Mela is the largest gathering of people for a religious purpose. According to Hindu mythology, Lord Vishnu dropped drops of amrita, at four places, while transporting it in a kumbha. Kumbh Mela is celebrated four times every 12 years, at Haridwar on the Ganges river, at Ujjain on the Shipra, at Nasik on the Godavari, and at Allahabad on the confluence of the Ganges, Yamuna and the river Sarasvati. While you are heading for a comfortable journey, the first thing you need to choose is a trusted car Rental Company. Reliable Cars Rental Services provides you a best car service in Pune city. We offer great number of cars in the city, including all kinds of economy, mid-range and luxury cabs.. With excellent services, we are available 24 x 7 for your service. You can book your journey at very cost-effective rates at Reliable Cars Services. You can book us online or by calling us at the customer car number available on our website. We assure you a safe, comfortable and enjoyable journey.